Teams continue Racing as they travel by ferry to Prince Edward Island where they will catch a plane via Toronto to Sudbury, Ontario. Once in Sudbury, they will choose a Chevrolet Trax to drive to the Vale Mining Company where they will line up to receive their next clue at 10am. Teams must now suit up in protective gear and descend, two teams at a time, into the mines. They will then smash fresh ore until they find a nickel pellet. Gino & Jesse maintain their lead and open up the next clue envelope which contains… a nickel. 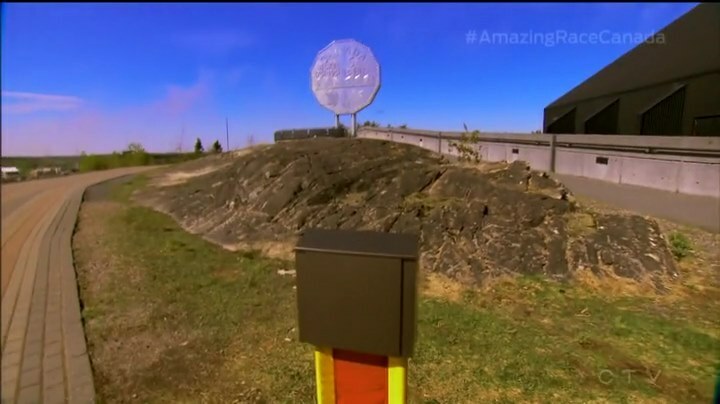 Teams must figure out their next clue awaits at the Big Nickel. That clue reveals the Detour AND a Fast Forward. Gino & Jesse decide to go for the Fast Forward. For this Fast Forward, teams will head to Science North where they will help feed Blanding’s turtles a lunch of worms and crickets. What teams don’t know is they must also eat a serving of worms and crickets to receive the Fast Forward. Neil & Kristin and Brian & Cynthia arrive and decide not to attempt the Fast Forward, so they focus on the Detour. For this Detour, teams will drive to Laurentian University. In Analyze, teams must investigate a crime scene by properly identifying all the evidence including 10 pieces of bones and teeth and properly flagging and measuring them to receive their next clue. In Synchronize, teams will join a synchronized swimming team and perform a routine to receive their next clue. This is another Limited Stations Detour and only four teams can attempt either Detour at a time. 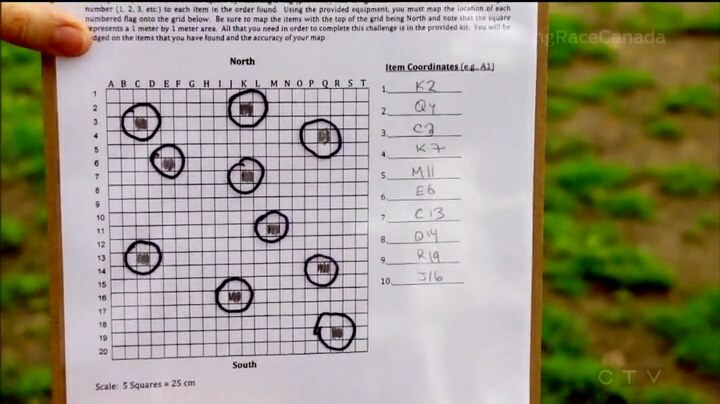 Both Neil & Kristin and Brian & Cynthia choose Analyze as do Nick & Matt who are currently in 4th. 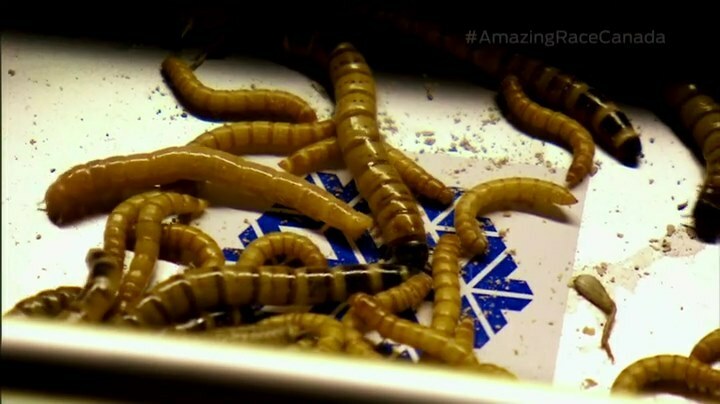 While Gino & Jesse’s turtle is not hungry, Brent & Sean choose Analyze. Nick & Matt join them and they get started. Brian & Cynthia are annoyed by Kristin being so loud. Back at the Nickel, Nic & Sabrina choose Analyze. Dujean and Ope both say they can’t swim, let alone synchronize swim, so they also choose Analyze. Uh oh. Brent & Sean arrive at Analyze, but think the others must be struggling, so they decide to switch. Nic & Sabrina take that last spot, so Simi & Ope decide to go to the other Detour to check it out. Cops Brian & Cynthia and Neil & Kristin ask for a check, but they have not mapped out their evidence correctly. They have to start over. Meanwhile, Gino & Jesse win the Fast Forward and head to the Pit Stop, the Bell Park Gazebo. Nick & Matt are the first to finish the Detour and open the next clue directing them to the Sudbury Outpatient Centre at Health Sciences North. Simi & Ope arrive at the pool after Brent & Sean have just failed their attempt. They decide to run back to Analyze, but Dujean & Leilani have taken the spot Nick & Matt have just left. Brian & Cynthia finally get approved on their 3rd attempt allowing Simi & Ope to get started. Nick & Matt arrive at Health Sciences North and find the Road Block: Who’s got heart? 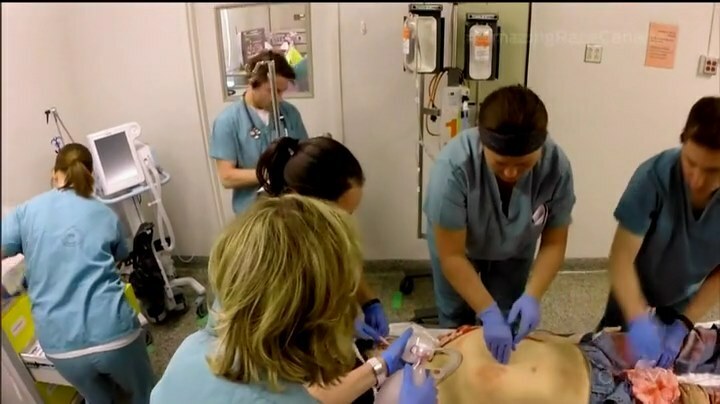 For this Road Block, teams will learn how to perform CPR and enter an emergency room to correctly perform CPR for two minutes on a computerized mannequin. Once the patient is stable, they will get the next clue. Matt starts the Road Block, but fails his first attempt. Across town, Gino & Jesse arrive at the Mat where they are welcomed by Alex Trebek in his hometown. Jon officially checks them in as Team #1. They’ve won a trip to any California destination of Air Canada as well as 5 million Petro Points for a full year of free gas from Petro Canada. Brent & Sean finally pass on their 5th attempt and they are off. Over at Analyze, while the other three teams continue to make mistakes with their measurements, Simi & Ope are able to finish on their 2nd attempt! Matt finishes the Road Block and he and Nick open the clue directing them to the Vale Living with Lakes Research Centre where they must canoe to the Pit Stop at Bell Park Gazebo. Cynthia starts with the Road Block and is confident with it since she was a paramedic for 13 years. But she fails. Sean attempts the Road Block, but he also gets the thumbs down. Brent is expecting Sean to overexert himself and have someone else perform CPR on him. Cynthia’s patient finally lives on her 3rd attempt and they are off as Simi & Ope arrive. Simi will do the Road Block. Back at Analyze, Neil & Kristin finally get the thumbs up on their 7th attempt. Nick & Matt got lost, eh, which allows Brian & Cynthia to arrive at the canoes at about the same time. But Nick & Matt finally move up one spot to finish #2. Brian & Cynthia settle for 3rd. Dujean & Leilani finish the Detour on their 7th attempt while Nic & Sabrina are in last. Sean finishes the Road Block after this 7th attempt while Simi finishes on her 2nd attempt. Brent & Sean get to the Mat as Team #4. Simi & Ope get into their canoe and Ope is about to freak out. 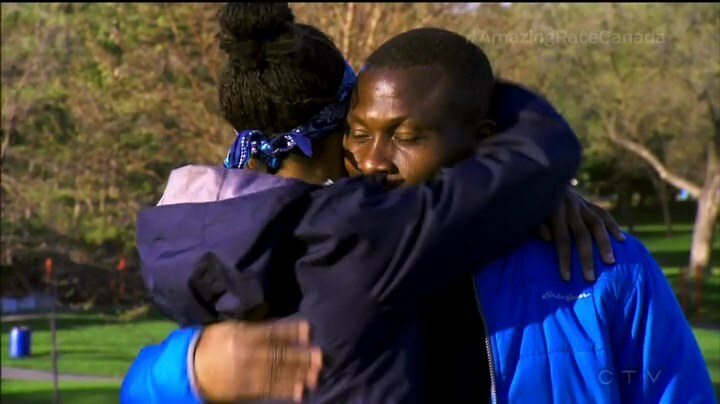 The thought of paddling in open water scares him half to death, but he gets through it and he and Simi check in as Team #5. 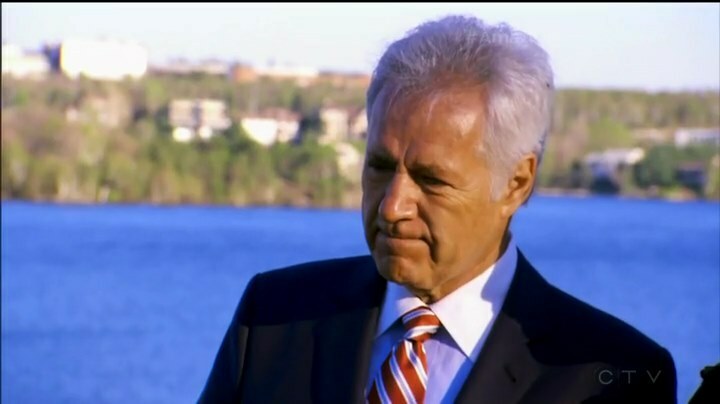 Alex Trebek tells them they just rowed across a lake he’s grown up on and asks how Ope is doing after conquering his fear of water. Alex is very touched by Simi & Ope’s relationship as he can relate. Meanwhile, Nic & Sabrina manage to get to the health centre before Dujean & Leilani. Kristin finishes the Road Block on her 3rd attempt as Leilani decides to do the Road Block. Alex Trebek has gone for the day as Neil & Kristin step on the Mat as Team #6. While Nic has trouble with the CPR compression rate, Leilani manages to save her patient on her 3rd attempt and she and Dujean leave. Sabrina tries comforting a frustrated Nic. It is after his 9th attempt that he gets the thumbs up. But it is Dujean & Leilani who step on the Mat as Team #7, leaving Nic & Sabrina in last and eliminated. Yes! This was another great episode and Leg. And woohoo to me not checking Wikipedia before watching the episode just this afternoon. Haha. Avoiding any spoilers definitely made watching this episode much more fun and exciting. I thought for sure Simi & Ope were done after waffling on that Detour. But as this season has shown us already, anything can happen and it isn’t over until Jon says it’s over. The equalizer after a TBC Leg was fully expected, so no problem there. The first task at the mine is a TAR staple and it was okay, though they need to lay off on the first come, first served tasks. Especially when we have another Limited Stations Detour. Did someone say TAR Philippines? I did! The Analyze Detour and the Road Block were basically the Detour from the Pangasinan Leg of TARPH2. I do think the CPR Road Block here was a little more exciting, the memorization of the operating room Detour in TARPH2 was good too. But TARPH2’s MURDER!!!! 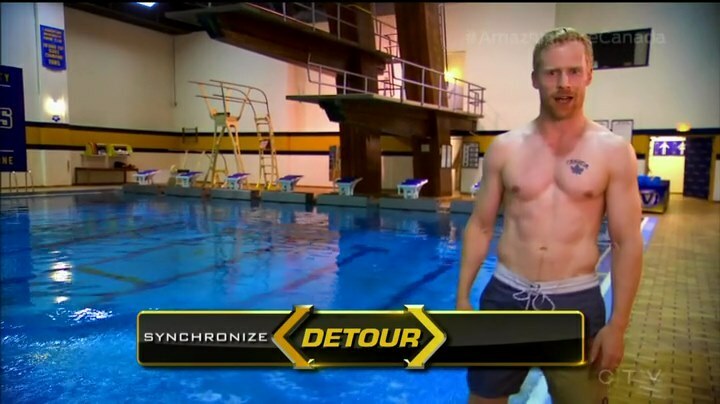 Detour was one of the best tasks of the season and one of the most creative tasks on any TAR in years. This TAR Canada Detour choice was slightly different and had a little more calculation to figure out. But I think I enjoyed TARPH’s Detour more since actual bodies were involved (actors of course, not actual corpses lol) and it felt more like an active crime scene. Still, good version here on TAR Canada though. 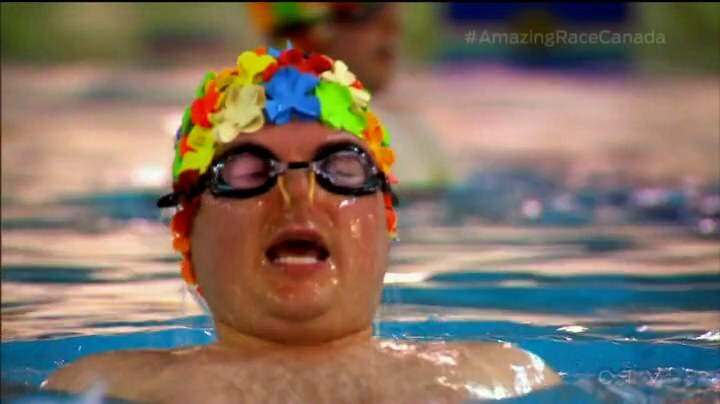 The synchronized swimming was alright and it helped provide that little bit of drama with Simi & Ope. The canoeing to the Pit Stop is a fine pre-Mat task (though we did see it last season too). And finally, Alex Trebek was a nice surprise. I forgot he was Canadian! Jon better watch out, Alex could make a great TAR host. Hehe. Neil & Kristin, Simi & Ope and Brian & Cynthia are definitely my favorites right now. Kristin and Brian are hilarious! And both Neil and Cynthia are definitely like their straightman sidekicks. It’s great (though kinda funny) to see Kristin perfectly fine this Leg after all the drama last Leg. And her “You silly girl!” at the Detour was hilarious. Simi & Ope coming from behind was an awesome moment, especially with Alex at the Mat. 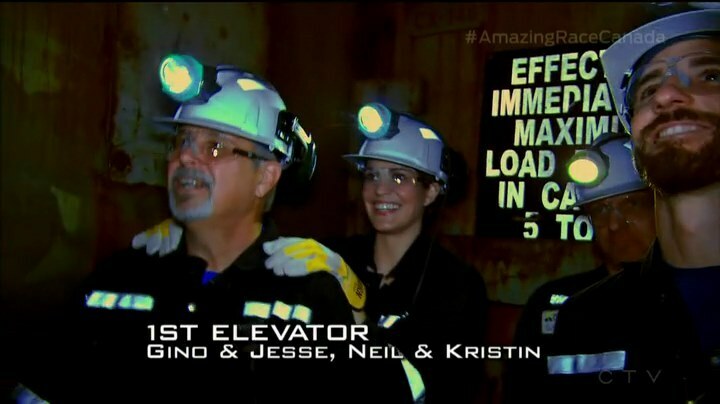 And Brian & Cynthia being confident in their skills only to not be so perfect at the tasks was fun. Especially after Brian’s little wink. Haha. I would love to see these teams as the Final 3. Brent & Sean were fun this Leg. They were the perfect team to do the synchronized swimming Detour because any other team would’ve probably complained about not being able to swim or hyperventilate or something. But they definitely had fun and provided some fun scenes. Them at the Mat was also very amusing. I am missing the fire from Dujean & Leilani. They’ve definitely lost a bit of momentum both Race-wise and entertainment-wise too. I think this is a good Leg for Nic & Sabrina to say goodbye. They’ve been fun and funny many times, but their Racing has just been a mess. While they were fun to watch and even had some nice, sweet little moments, it was their time to go. 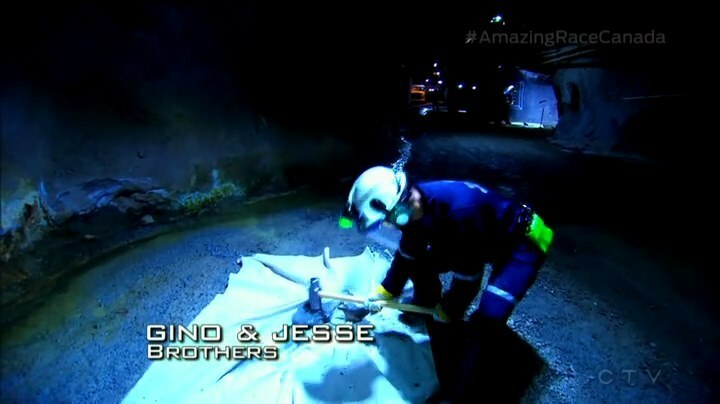 Gino & Jesse winning another Leg kinda scares me since they’re setting themselves up as the team to beat. But since it was only the Fast Forward, we’ll just not worry about another all-male team winning TAR Canada just yet. lol And Nick & Matt may be last on my list, but I definitely still like them too. It’s good to see them consistent on the Race without absolutely dominating. They too are setting themselves up to be Finish Line contenders. ← Recap: Shuriken Sentai Ninninger, Episode 24 – It’s Summer! Western Youkai Arrive in Japan!